I was meant to post this ages ago but this post got lost in my drafts (my bad) but since the new year began I've been trying to get onto a little bit more of a health kick. 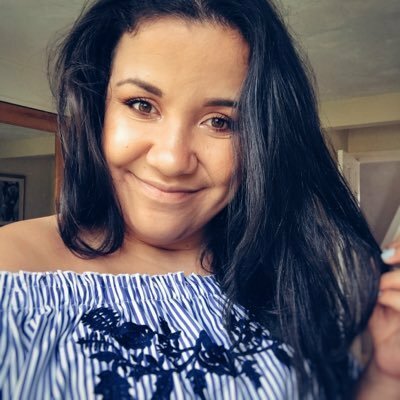 I'm not the perfect size, perfect weight or super skinny but I'm going to try (bit by bit) to make my lifestyle a little bit healthier. This set from Breville costs only £30 and it's such good value for money. 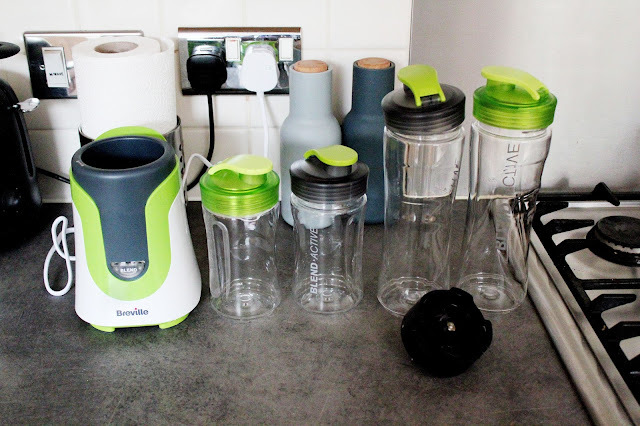 This comes with two 600ml size bottles (when you want to make larger smoothies) and two 300ml size bottle for smoothies on the go. What I love about this smoothie maker is that it's so easy to use. 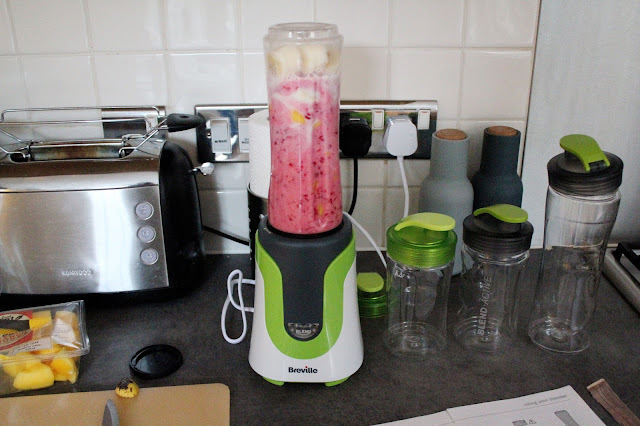 There's measuring in (ml) bits along the side and what I do is measure 150ml (in the 300ml bottle) and 300ml (in the large 600ml bottle) of almond milk, chop up some fruit and add in frozen berries and you're good to go. 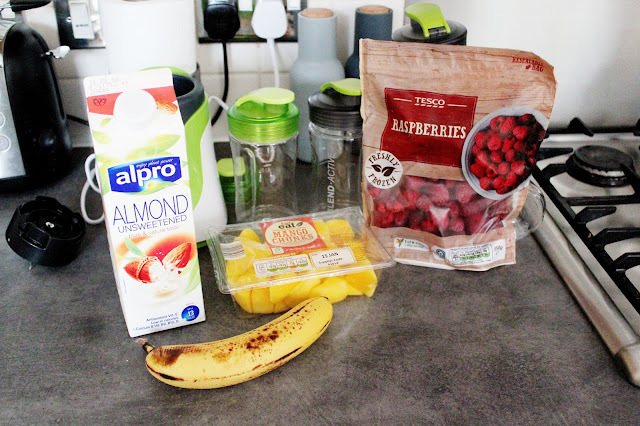 What I love about smoothies is you can add in whichever fruit you want (even the ones you wouldn't normally go for) and make it into a smoothie and it will taste delicious. I love using the smoothie recipes in the Deliciously Ella books. 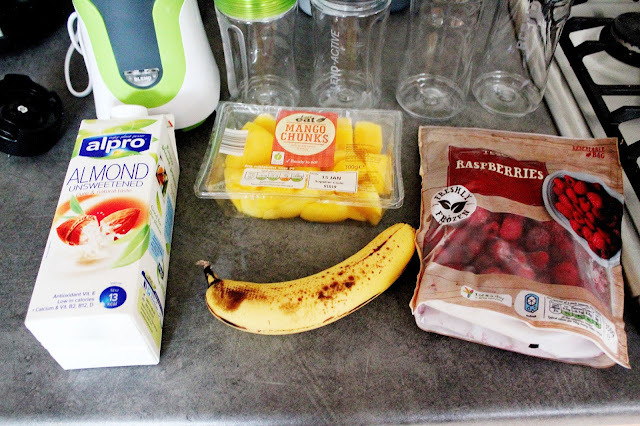 Here I'm using a banana (I ended up using half), a handful of mango chunks, almond milk and frozen raspberries. This is so yummy! 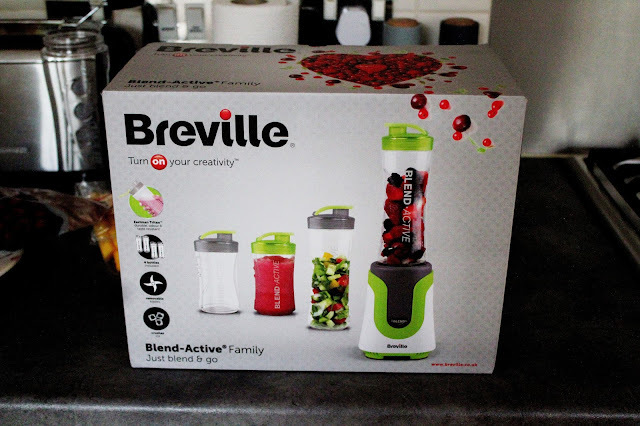 I love how quick and easy this smoothie maker is to use (it literally takes 30 seconds) but one thing I'd say is blend for slightly longer to make sure your smoothie is smooth as sometimes I forget and it ends up being full of bits of fruits. I'm buying one! One of my best friends has one and looooves it!